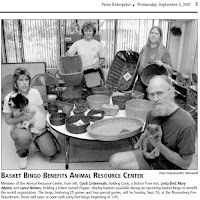 Members of the Animal Resource Center display baskets available during an upcoming basket bingo to benefit the no-kill organization. The bingo, featuring 25 games and four special games, will be Sunday, Sept. 16, at the Bloomsburg Fire Department. Doors will open at noon with early bird bingo beginning at 1:45.